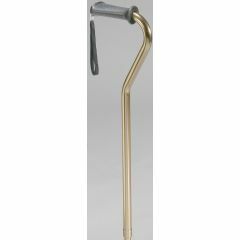 Aluminum Ortho K Grip Cane by Drive Medical features an angle adjustable, ergonomically designed, contoured hand grip that adjusts to fit the users wrist and hand. This feature will reduce stress on the users hands and joints when they use they cane. These canes can be adjusted from 30" to 39" in height very easily by pushing a single button. They have a soft and comfortable contoured handle to reduce stress on the hand. These canes are only 1" in diameter, yet can support up to 300 pounds in weight without breaking or cracking. This product is also backed by Drive Medical's Limited Lifetime Warranty. The handle fits my hand perfectly and is very comfortable.